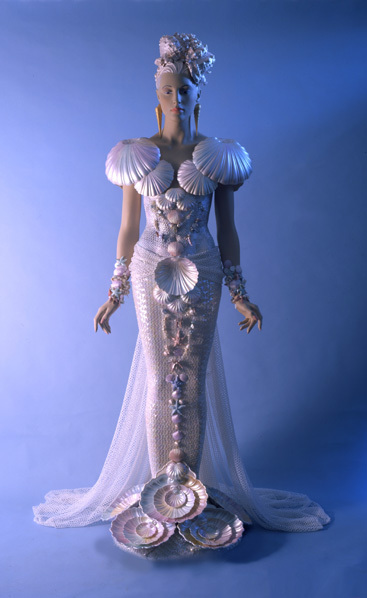 Bridal display for Fortunoff, a bridal gown on a seashell theme. 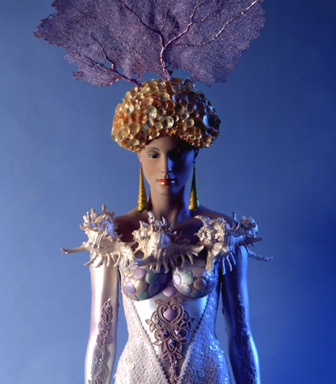 Hair, hundreds and hundreds of jingle shells; headdress, a sea fan; gown, pearly painted resin casts of many different shells, large, small, medium, and tiny; paper sculpture frill at bottom of dress imitates crenellated shell form. 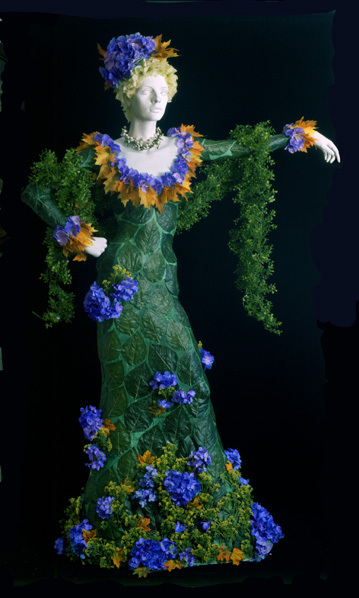 Costume is on a commercial mannequin, painted by the artist. 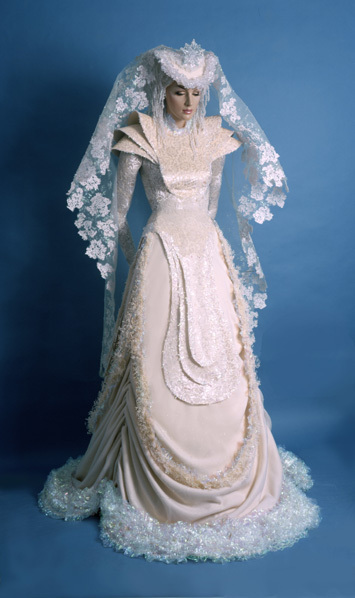 This series of bridal gowns, built on mannequins for Fortunoff window displays, were done to promote the store's bridal department and gifts. 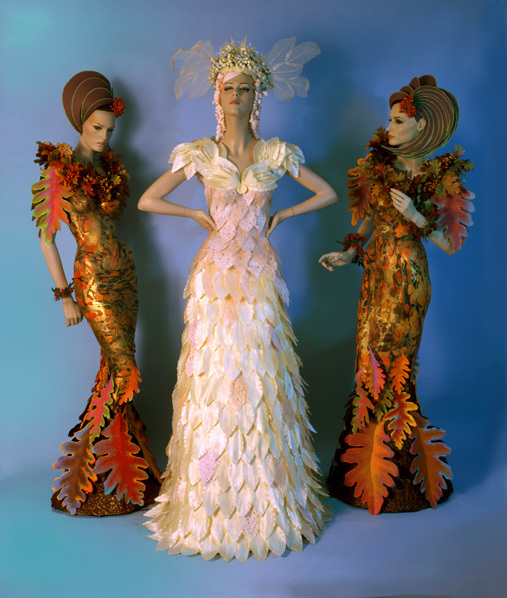 They include gowns made of shells, house wares,( i.e. paper plates, plastic spoons, doilies, and telephone wire) snow and ice (artificial) and autumn leaves. 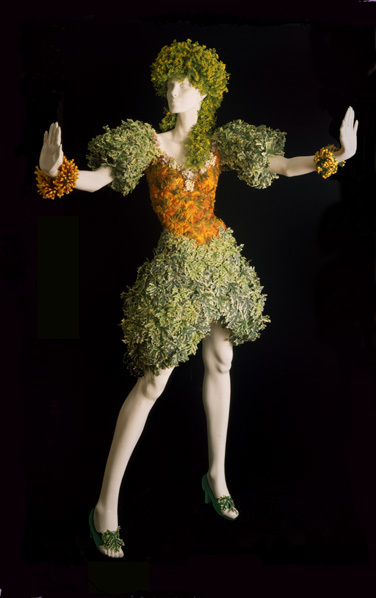 "Spring big for Mother's Day" was the theme for a group of dresses made of springs, large and small. 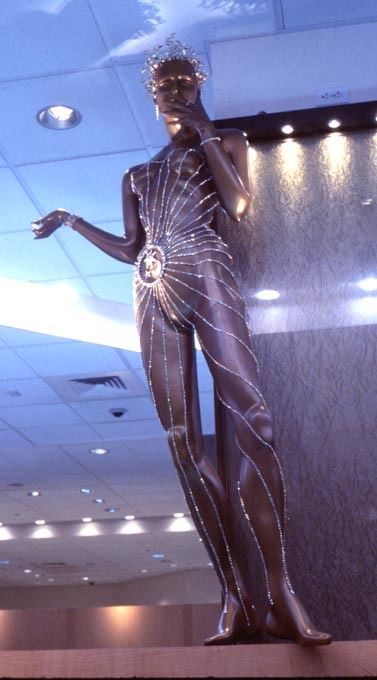 The sizes ranged from about 1/2 inch to very large, made of TV cable, wound around the body. 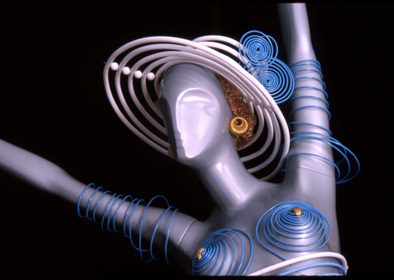 The springs were painted in colors, and the cable was dyed with special plastic dyes, often in color combinations. 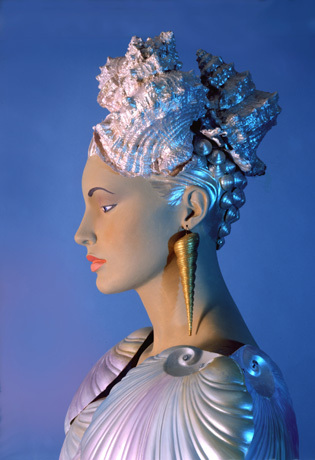 Wigs were made of copper and steel "wool", electric wire curled round a dowel, and more springs. "Spend it here, Tourists!" 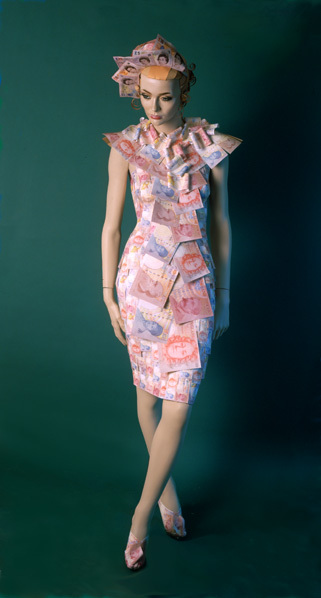 was the theme for a series of frocks and gowns made of paper currency. 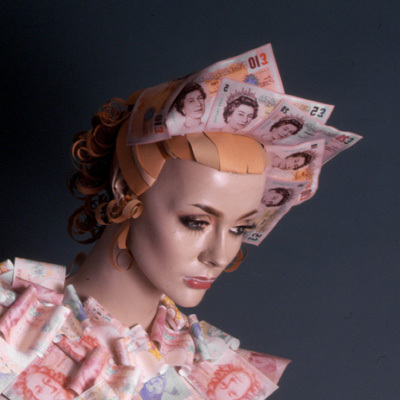 The bills of various countries and continents, Mexican Peso and Chinese Yuan, American Dollar and Japanese Yen, English Pound and Euro, were digitized, sizes changed, colors a bit pumped up on the computer. 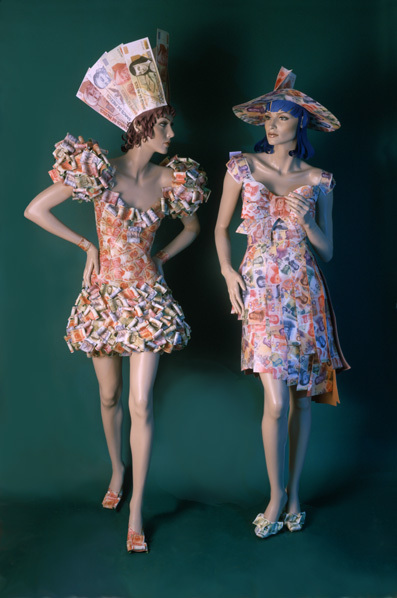 Multiple copies were made, snipped apart, curled, folded, spindled and mutilated, into the dresses featured here. 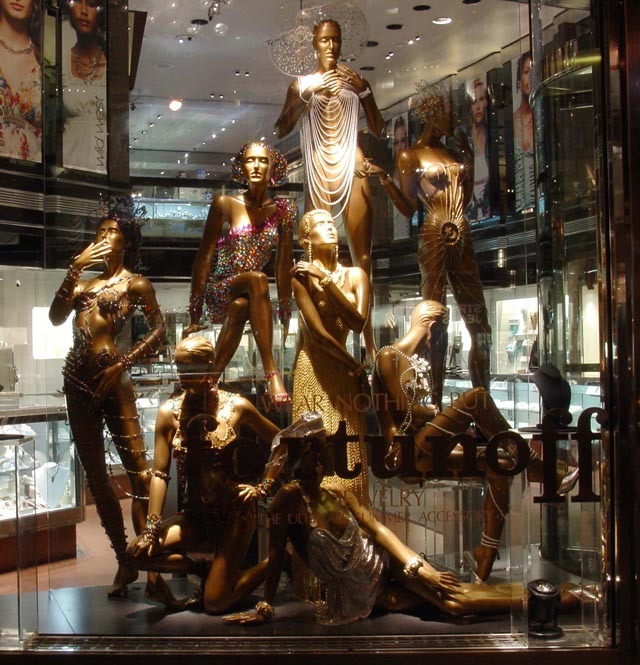 They are modeled on life sized mannequins. 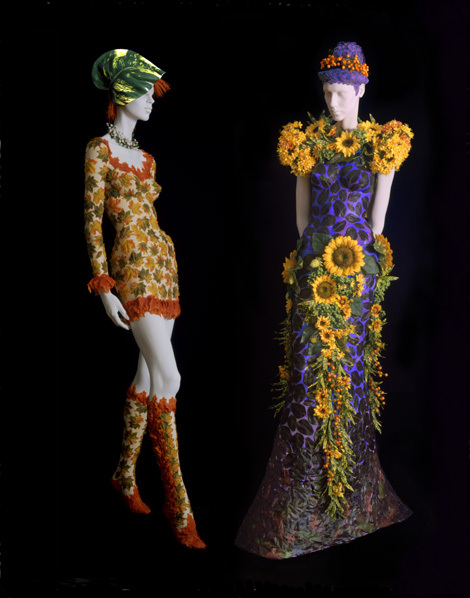 Summer gowns and frocks made of silk leaves and flowers decorated Fortunoff stores in several locations. 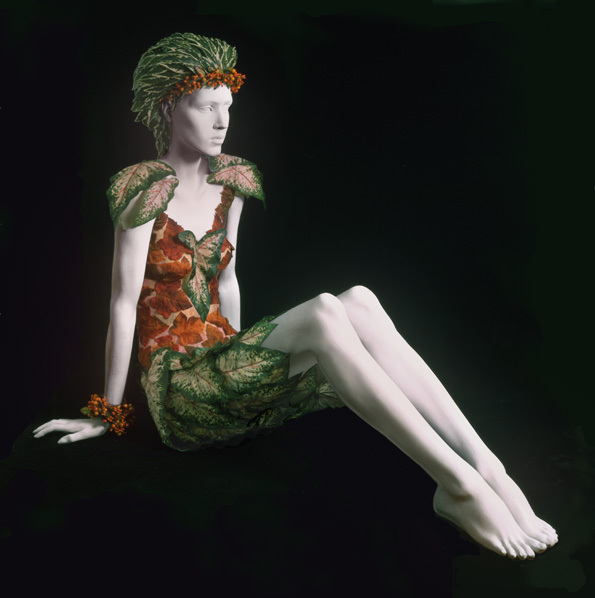 Leaves and flowers of many kinds were combined into fashionable outfits, to wit: Caladium, Maple, Sunflower, Croton, Citronella, Red Hot Poker, Hydrangea, and Begonia. 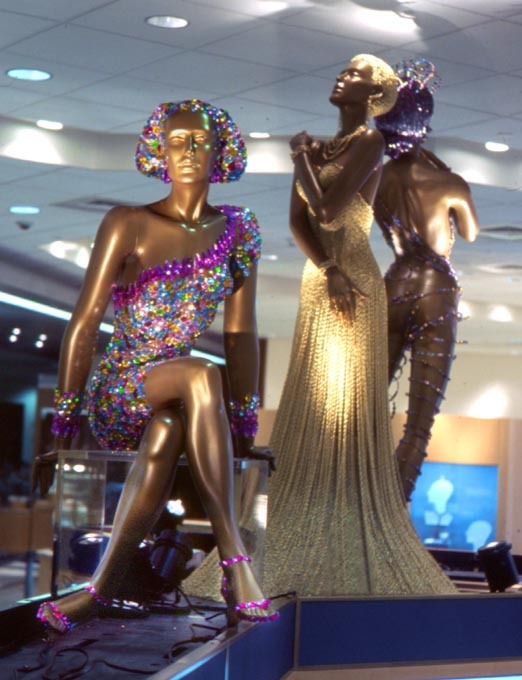 Group of mannequins costumed with different kinds of jewelry, done as a display for Fortunoff, a ritzy jewelry and bridal store with several locations.The group consisted of outfits made of pearls, gold chain, rhinestone chain, beads, and multicolored jewels. 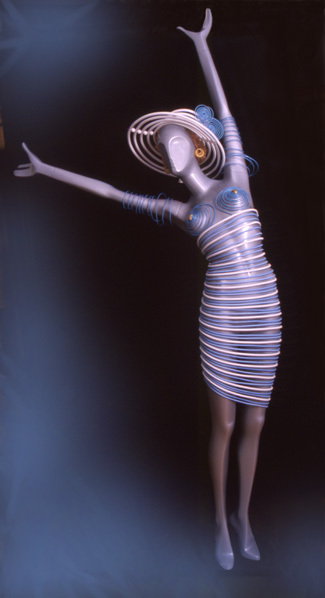 Jewelry dress made of pearls, with pearl sizes in ascending order. 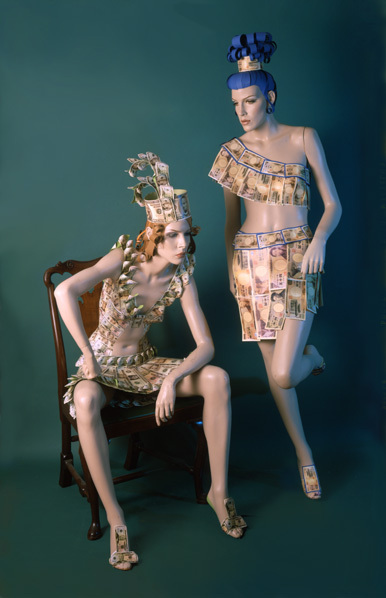 These jewelry costumes were done for the various Fortunoff store locations, where they were used as diplays for over a year. 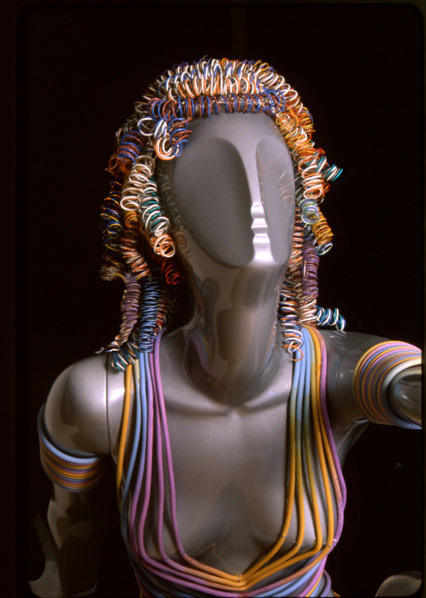 Jewelry dress made of various kinds and colors of beads, strung on lengths of spring wire, and looped around the mannequin's body, to resemble clothing. 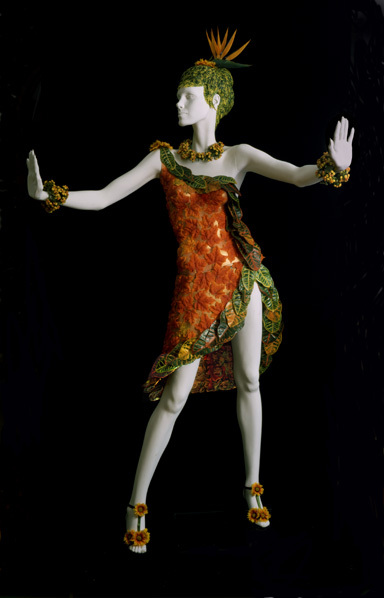 Jewelry gown made of gold chain, the bodice wrapped around the mannequin's torso, the skirt draped over a hard foam skirt form. 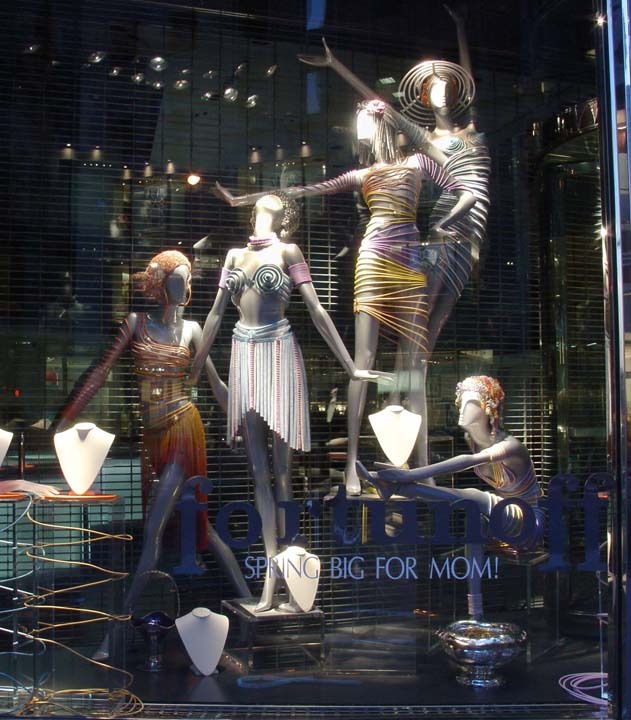 Jewelry costume made of rhinestone chain in a spiderweb pattern, as if the mannequin had walked into a giant web of rhinestones and it imprinted the pattern on her body. 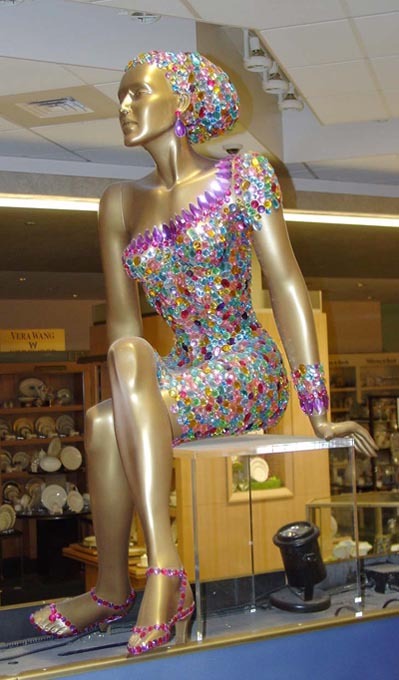 Jewelry dress and hairstyle made of multicolored different sized jewels arranged in patterns; mannequin dressed in gold chain gown, see above.